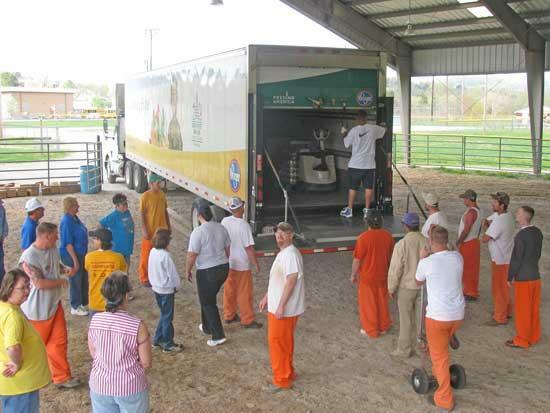 On April 7, 2010 at the Justin Pemberton Arena over 18,000 pounds of food was given out to members of the community and hosted by the Cannon County REACH Afterschool Program. This amount of food served approximately 600 families in the community, such as: Community members, Head Start, REACH and other orginazations. Boxes were also delivered to the Holiday House Residents. An assortment of items given out were: misc. bread items, canned vegtables, bottled water, cakes and pies, potatoes, apples, salad items, meat, rice, yogart, milk and much, much more. The amount of many items was limited; therefore,the items in individual boxes was varied. This was made possible through a partnership with Second Harvest Food Bank, REACH Staff, Sheriff Billy Nichols, Jail Administrator Anna Nichols and the inmate labor program, Work Crew Supervisors, Woodbury Police department for doing traffic control, County Executive Mike Gannon and Community Volunteers. This program strives to assist families with free food in Cannon County. It would not be possible without the planning, organization and assistance of many individuals. A Huge Thank You to everyone that assisted and donated countless hours and physical labor for this event. Many people expressed their thanks and needs for the food they received during this econimally challenged time. The REACH Program is a community based program that serves the community through many services. I'm so very grateful for the food, but people we need jobs here in this county... Bringing jobs to Cannon County will eliminate us having to go this route.... somebody help us bring industry here. WE NEED GOOD PAYING JOBS HERE FOR OUR CITIZENS.